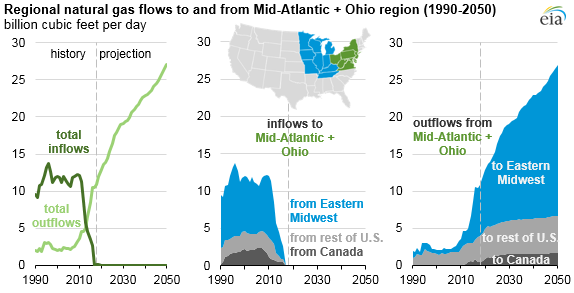 In rapid and dramatic fashion, the eastern U.S. and parts of the Ohio River Valley have moved from being net importers of natural gas for industrial and domestic consumption to net exporters. In part, natural gas produced from the region now flows to the U.S. Gulf Coast for processing into liquefied natural gas destined for export markets that are new to domestic producers. 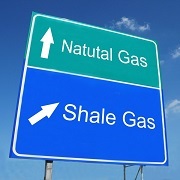 The Energy Department’s Energy Information Administration (EIA) said that although the South Central region contains shale plays that produce natural gas — including the Wolfcamp in the Permian Basin and Haynesville — natural gas consumption there outpaces production, requiring additional supplies. In 2008, natural gas flows into the Northeast averaged 12 Bcf/d, EIA said. However, by 2013, these volumes had dropped to 5 billion cubic feet per day (Bcf/d). Today the region is a net natural gas exporter. 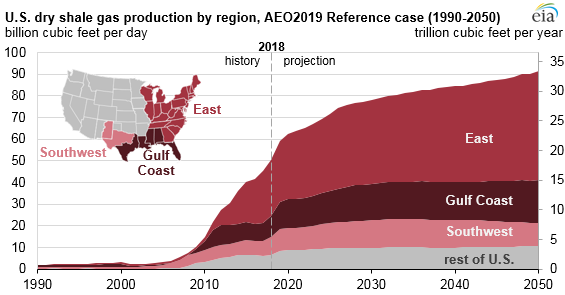 Total U.S. dry natural gas production is driven by continued development of the Marcellus and Utica shale plays in the East region, and dry natural gas production is forecast to reach nearly 120 Bcf/d by 2050, compared with 75 Bcf/d in 2017, EIA said. Dry shale natural gas production in the East accounts for over half of this growth. EIA said that production could more than double during the period from 24 Bcf/d in 2017 to 50 Bcf/d in 2050. 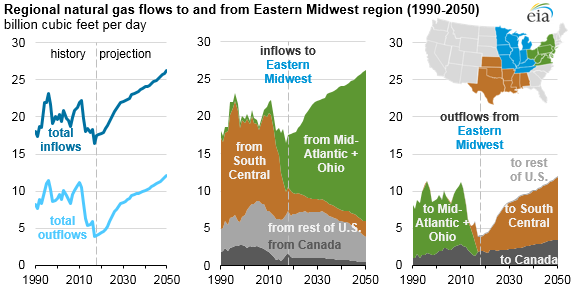 Source: EIA — The South Central region historically has been a net exporter of natural gas to other parts of the country, particularly to the east. But demand growth is forecast to outpace production growth in the region, EIA said. Growing U.S. liquefied natural gas export volumes are the main contributor to this growth. Export capacity is expected to double from 5 Bcf/d to 11 Bcf/d by the end of 2020. In early March, Cheniere Energy and Bechtel Oil, Gas and Chemicals announced “substantial completion” of the first train of the Corpus Christi liquefaction project. Under sale and purchase agreements with Endesa SA and PT Pertamina, the first commercial delivery is expected to occur in June. Additional exports are expected to begin in June under an agreement with Iberdrola SA. Source: EIA And in February, ExxonMobil and Qatar Petroleum said they will move ahead with development of the Golden Pass LNG export project located in Sabine Pass, Texas. Construction on the $10 billion liquefaction project is expected to begin in the first quarter of 2019 and the facility is expected to start up in 2024. The project is planned to produce around 16 million tons of LNG per year. With those projects, among others, the U.S. is poised to become the world’s third-largest liquefied natural gas (LNG) exporter, with export capacity behind only Australia and Qatar. Domestic LNG export capacity is expected to reach 8.9 Bcf/d by the end of 2019. In addition to increased LNG exports, EIA said that natural gas pipeline exports to Mexico and consumption in the industrial and electric power sectors also increased. As a result, the South Central region is projected to become the fastest-growing demand market in the United States. Source: EIA — EIA said that this reversal of flows was accompanied by increased bi-directional capacity on interstate pipelines and by new pipeline capacity to transport increased natural gas supplies from the Marcellus and Utica Basins to domestic and international demand markets. From 2008 to 2018, pipeline capacity out of the Northeast (which includes both the Mid-Atlantic and Ohio region and New England) grew from an estimated 5 Bcf/d to 23 Bcf/d. To transport increasing volumes of natural gas from the Mid-Atlantic and Ohio region to demand in the South Central region, EIA said that additional natural gas pipeline capacity will be built from the Mid-Atlantic and Ohio region. An additional 4 Bcf/d of pipeline capacity out of the Northeast is expected to be built in the coming years. "ECS offers an industry first: "Money Back Guarantee". In the unlikely event you lose money on any of our cost savings strategies, we will write YOU a check. That's right! ECS assumes all the risk of our review and recommendations. No other firm has this guarantee. You can never lose money with ECS. Never!" Get the latest industry news and information delivered right to your email inbox! Nothing contained on this website shall constitute the giving of consulting, professional or legal advice, or a solicitation to purchase services or products from any of the companies presented as case studies. You are strongly advised to conduct extensive due diligence including seeking advice from competent advisors. No reliance should be placed on any information contained herein, all of which should be independently verified and evaluated. Site designed by CRE-sources, Inc.